Upon arriving in Penny Gate, Sarah and Jack are welcomed by the family Jack left behind all those years ago—barely a trace of the wounds that had once devastated them all. But as facts about Julia's accident begin to surface, Sarah realizes that nothing about the Quinlans is what it seems. Caught in a flurry of unanswered questions, Sarah dives deep into the puzzling rabbit hole of Jack's past. But the farther in she climbs, the harder it is for her to get out. And soon she is faced with a deadly truth you are in frshe may not be prepared for. There are some authors that are automatic 'must reads', those that you have read enough times to know you are in for a real treat. 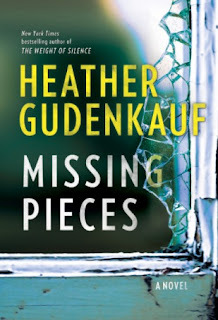 Heather Gudenkauf is one of those authors. Her books have always kept me engaged and I love her writing style. With Missing Pieces I didn't even read the synopsis but just dove right in. Missing Pieces is a murder mystery that reopens events from years ago. It's about a husband who kept his true past a secret from his wife, telling lie after lie to conceal a past that he didn't want exposed. But now that all explodes with dire consequences. Told from the point of view of Jack's wife Sarah the story begins with them returning to Jack's hometown when tragedy strikes. I had a hard time getting into this book initially, but when it took off I was hooked. The story line kept me engaged, dawning my sleuth cap trying to figure out what took place years ago and what might happen next. 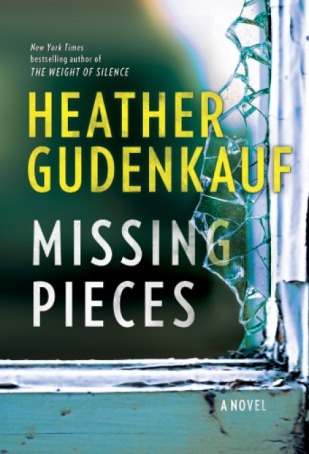 Heather Gudenkauf has a nice ability to ingrain twists and turns to keep one guessing. But I did have a hard time connecting with some of the characters here - I was suspicious of the whole lot, which I suppose is a good thing. I didn't really feel any sympathy for any of them. But the thing that I really struggled with here was Jack and Sarah's relationship. Being together for over 20 years and with the strong bond (I was lead to believe they had), it was hard to see her doubt him. To think him capable of such violent acts and to actually fear him, that didn't resonate well with me. That being said I can't say that this is her best, but it was still an entertaining book.